It’s quite unfortunate to see how the greatest country in the world, The United States of America, demanded no discrimination from Nazi Germany during the Olympic Games in Berlin, when they themselves failed to provide equal rights to their own people at home. While Stephen Hopkins’ Race touches a painful subject for all Americans, it however tells an incredible story of one man who made his country proud. Sadly, not too proud enough to treat him equally after his big wins. 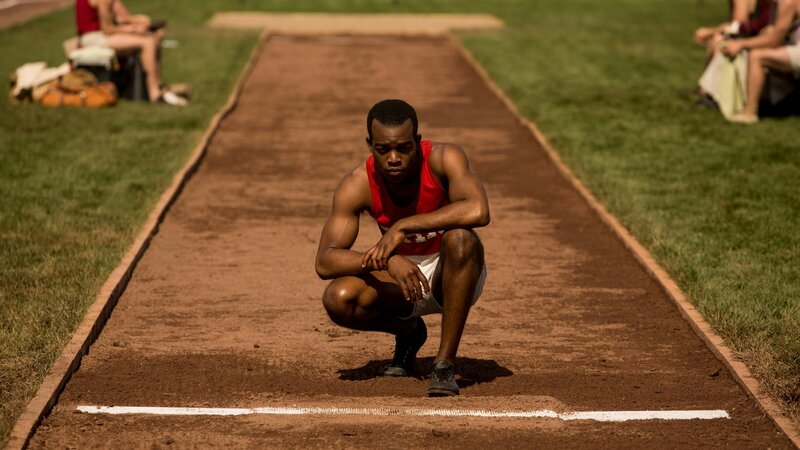 Race centers around Jesse Owens (played by Stephan James), a great American athlete, whose participation at the 1936 Olympic Games in Berlin brings him four gold medals. However, his quest begins much before, when he meets his coach, Larry Snyder (played by Jason Sudeikis), whose great vision does not fail him, when he chooses Owens for the Olympics. Although the biggest game continued behind the curtains, when Avery Brundage (played by Jeremy Irons), a leader of America’s Olympic organization begins his fight against a boycott of the 1936 Summer Olympics due to Adolf Hitler’s hatred of Jews and black people. When the film begins, we find Jesse Owens on his way to high school, where he wants to start his quest to reach the top. Being labeled as “colored” man, Owens must face discrimination in his own country, while his desire is to represent his country at the world stage. Owens’ first meeting with Snyder is indeed memorable, however, makes him to face an extra challenge, where he at his young age must support his daughter, and soon to be married girlfriend. When Snyder realizes the reason of Owens skipping training, he helps him out to ensure that nothing will distract him from winning on the track. As the film unfolds, you see how Owens breaks one world record after another, while Brundage’s negotiations with the Ministry of Sport of Germany reaches its peak. Finally, when Brundage reaches a long awaited agreement, where Germans won’t go against Jewish and black athletes, it’s Jesse Owens’ show time, where he must win big in front of Hitler and the German crowd to show that even black people can win a race. Hopkins’ film is emotionally charged. It shows the conflict of interest, and the struggle of black people in America itself. However, that should have been emphasized a bit deeper, where one country can’t ask the other one for respect when it can’t do the same at home. In the meantime, it’s a crowd pleasing film that talks mainly about track race, and the issues Jewish athletes had to face at the Olympic Games. It is certainly fun to see how Jesse Owens gets one Gold Medal after another, while Hitler attended the games. In spite the film having a right dynamic pace, you feel the time passes too quickly and there was something that was missing in this story. In conclusion, Race is a film that should be seen if you want to be educated about the events that occurred back in time, when Jesse Owens became an American hero, even if for a short amount of time. It may not be a great film about the racial issues America and the world had to face, but perhaps, it’s Hopkins who found it too difficult to touch both subjects equally in one film, which does not seem right at all. If not for that, this film would have been much better than it is. But it still is a good film to watch.